What Steve Lonegan can teach Republicans about making life hell for Democrats. New Jersey Senate candidate Steve Lonegan may not beat Cory Booker, but his run offers some interesting lessons for Republicans. I’m betting that the candidate with the poll lead, higher favorables, and more experienced campaign team will, indeed, win, but I’m interested in how the race has become a test kitchen for attacks on liberals. 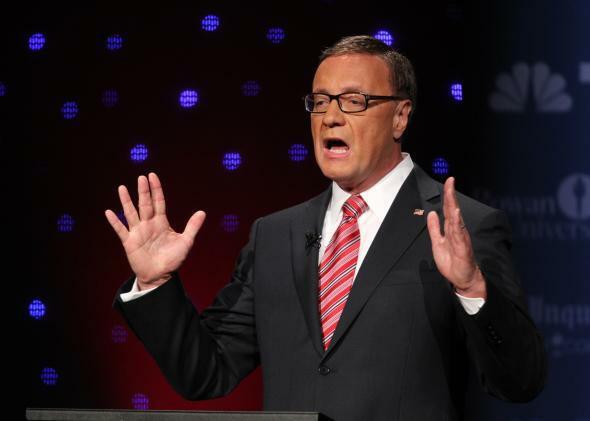 Steve Lonegan, Booker’s opponent, is running his third statewide campaign, his first as a nominee. * He’s been bolstered the whole time by conservative groups that want to play in every race—the Susan B. Anthony List, the Tea Party Express—and by the American Principles Project. The strategy from the candidate on down has been to portray Booker as a Hollywood phony who’s also more extreme than he lets on. The goal: Make it tough for Booker to portray Lonegan, who’s a down-the-line conservative, as the “extremist.” In this Oct. 4 debate clip juiced by SBA List, Lonegan demands that Booker answer for his NARAL-approved stances against the Hyde Amendment and late-term abortion bans. It was around this time that Booker’s campaign finally acknowledged Lonegan in a TV ad, using a clip where Lonegan called himself a “right-wing extremist”—actually sort of a joke from Lonegan about how he was viewed. So in an ad from the American Principles Fund (another arm of the AP Project), Lonegan’s claims got amplified. Roberts was actually wrong about this. The “safe and legal” (not rare) line was unchanged from the 2008 platform. Booker did not serve on the 2008 committee. As Jeff Jacoby reported last year, “safe, legal, and rare” was introduced by the Bill Clinton wing of the party in 1992 and used until 2004. Booker didn’t mention any of this—probably wise, because it’s pointlessly confusing. The lesson Lonegan et al are trying to teach is that Republicans need to shoot out the knees of Democrats by making their most unpopular positions famous. “Booker in disarray” is the preferred media narrative of this race, but that doesn’t account for how the guy is still winning, still miles ahead of Lonegan on favorability. The real story is that Lonegan, the first truly right-wing nominee the state party’s nominated since 2001, ran away from none of his positions and mocked Booker in ways that startled the media. That’s proved to be more effective than trying to squeeze out Booker from the center, and marginally weakened a candidate whom no moderate Republican ever wanted to challenge. *Lonegan, the mayor of the small borough of Bogota for more than a decade, ran for governor in 2005 and 2009. He ran a poor fourth in 2005, but in 2009, powered by Tea Party activists who worried that Chris Christie would be too liberal, he won 42 percent of the vote.